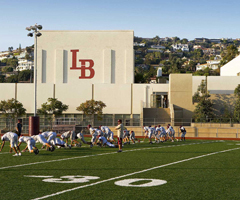 School Accountability Report Cards are reports on the individual performance of all schools within the Laguna Beach Unified School District by our hired consultant: Documents Tracking. Within these reports, you'll find statistics on student enrollment and suspension/expulsion rates, class sizes, school expenditures, salaries for teachers, staff and administrators, teacher credentials, teacher assignments and vacant positions, and teacher compliance of federal No Child Left Behind (NCLB) academic standards. You'll also find what programs in the school were federally funded, the School Site Safety Plan, information on school facilities and results of the most recent school site inspection, professional development of staff, information on curriculum, instructional materials and what textbooks are currently being utilized, California Physical Fitness Test results, California State Testing (CST) proficiency statistics for all students, whether or not the school meets Adequate Yearly Progress (AYP) criteria, Program Improvement (PI) status, and Academic Performance Index (API) ranking and changes. The District no longer does annual District Accountability Report Cards, but there are archived records of previous DARCs on the website for documentation purposes. The DARCs were done by Documents Tracking and account for certain District-wide programs and collate statistics on student performance for the entire district that year. For programs, the reports detail the District's enrollment statistics for Title I Funding. For student performance, the report compiles District-wide statistics for No Child Left Behind (NCLB) Adequate Yearly Progress (AYP), what schools meet Program Improvement (PI) standards, District-wide statistics for students that are considered Proficient or Advanced in Language Arts, Math, Science and Social Science after being assessed by the California Standardized Test (CST), and the percentage of teachers throughout the District that meet NCLB standards to be considered a "Highly Qualified" teacher.